Are you seeking a safe, homely caring environment for yourself or for a loved one? Please call us, or come and look around as Kirk House could be just what you are looking for. We have more than 50 years experience of caring for people at Kirk House where we take great pride in offering a highly professional, personal, quality care and nursing service for frail elderly. Our facilities, skills and expertise enable us to offer a wide range of care, starting with residential and respite care right through to nursing and palliative care, ensuring every resident receives individual care. For visitors and more residents who wish to visit town, we are only a few minutes stroll from the Uttoxeter Town Centre, Tea and Coffee Shops, local Medical Practices and Churches. 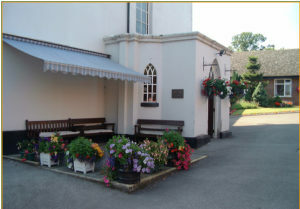 Kirk House is owned by Uttoxeter & District Old People’s Housing Society Limited, a non-profit registered charity, managed by a group of dedicated, knowledgeable, business and quality driven, local Trustees. If any annual surplus revenues are generated they are fully re-invested for the benefit of Kirk House and our residents. Kirk House is not answerable to any shareholders nor do any shareholders benefit in any way from revenue generated. Kirk House exists solely as a local charitable care service for the people of Uttoxeter and the surrounding area.